Dodger Dog is on a mission to stop thousands of healthy Staffies and Staffie Crossbreeds from being euthanised every year in the UK. 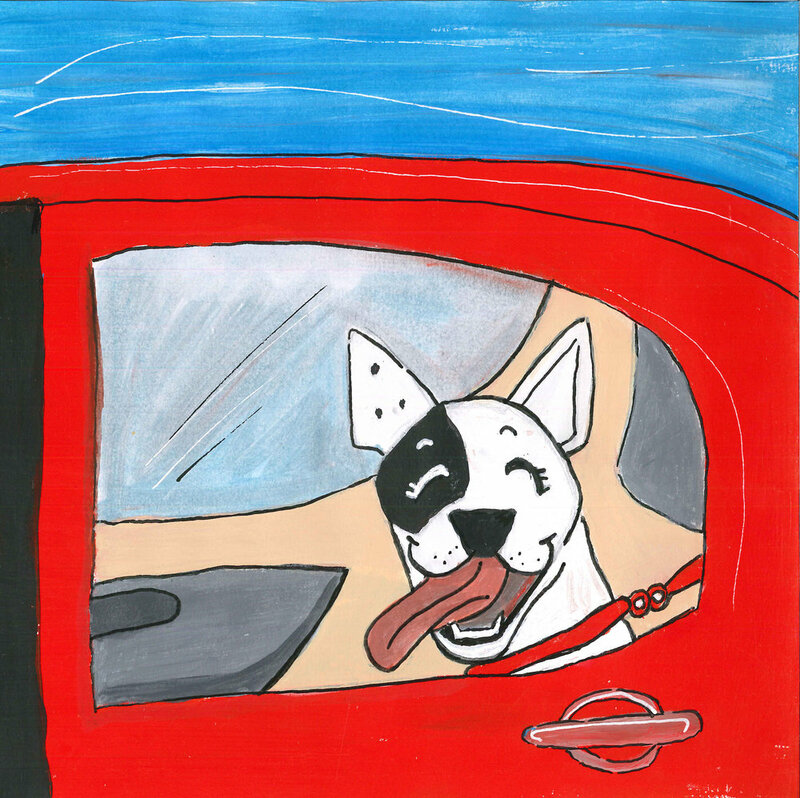 The Dodger Dog book series is aimed at children aged 3 – 6 years. Responsible dog ownership is the recurring theme, however, each story delivers other messages about adoption, caring for the environment, disabilities and more. Thousands of healthy Staffies and Staffie Crossbreeds are being euthanised every year in the UK. Dodger Dog is on a mission to stop this, by teaching children from a very young age about responsible dog ownership. The Staffordshire Bull Terrier and Staffie crossbreeds are some of the most owned breeds in the UK, and it is this popularity that has also brought great suffering to them. These popular dogs are being over-bred, and their appearance seems to attract certain types of owners - those who see them as status symbols. As a result, every year thousands end up in Council Pounds and Rescue Centres because they are left without homes. Due to such high numbers, healthy dogs are being destroyed, they are being 'put to sleep' simply because they have nowhere else to go. "EIGHTEEN STRAY DOGS PUT TO SLEEP IN THE UK EVERY DAY"
In the UK, local authorities’ records show that approximately 100,000 stray dogs are picked up every year. Luckily, many of these dogs are either reunited with their owners or put into Rescue Care, where they are health-checked and cared for until a new forever home can be found. For Staffies however, rescue spaces are hard to find, as most are already full of Staffies, and there are limits on the numbers of their particular breed that can be cared for at one time. A healthy dog currently has a 7-day tenure in a Rescue Centre and if a forever home has not been found by the end of this term, sadly, the dog is destroyed. Around 7,000 dogs are euthanised every year in the UK (and over 10,000 in Ireland) after their 7 days in the Pound is completed. Bearsted Dog Show. What a lovely day out with the real Dodger Dog, promoting his book. that the majority of these 'death-row dogs' are Staffies. It's not the fault of the Local Councils or the Pound staff - the people who care for the stray and abandoned dogs and are then forced to call in vets to give the dogs their final injections. It is the fault of the owners, the people in our society who allow their dogs to breed with no proper thought or care given to where those puppies might end up, and those who take on a dog without thinking seriously about whether or not it is right for their personal circumstances and lifestyle. I am a very lucky little dog, I have a loving family and lots of friends to play with. My owner then told the lady he had found me in the street, and then he handed me to her and walked away. After a short drive we arrived at a strange building, it didn’t look as much fun as I had hoped it would be. Dodger Dog is himself a Staffie Cross Breed and was also abandoned. As a 3-month old puppy, he was left at the RSPCA Harmsworth Hospital in London - the people who took Dodger there explained to the staff that they had found him in the street. When the staff advised them that they should contact the local council and speak to the dog warden in order to hand over a lost dog, the people walked away, leaving Dodger in the street outside the hospital. The Harmsworth staff promptly took him in and took the first steps in changing and possibly saving, Dodger’s life! After examination by the vet, it was discovered that Dodger had an untreated skin condition, yet despite everything that had happened, and the discomfort that he must have been in, this puppy, now known as "Dodger Dog", was a friendly, happy and loving puppy, definitely worthy of their help. Dodger received the treatment he needed for his skin problem and settled into life at the hospital. He became quite a hit with the staff at the Harmsworth, but they are there to treat animals and are not equipped to board them, and it is an unfortunate fact that healthy animals in their care will reduce the number of valuable kennel spaces for sick and injured animals. Dodger’s friendly disposition and loving nature made the team want to help find him a fabulous forever home, they looked daily for space in a rescue centre, but, unfortunately, there were none available for him. Dodger actually ended up spending 2 months at the Harmsworth Hospital waiting for a place in a rescue centre. As it was summertime, traditionally a very busy time, this was not at all unusual. that the majority of these ‘death row dogs’ are staffies. One of the visiting Animal Welfare Officers fell in love with the friendly pup, taking the time to visit him whenever she was called to the hospital. That is where I come into the story. That AWO was my daughter Siobhan! We had lost our two elderly Dalmatians earlier that summer and we were starting to think about getting another dog. Working for the RSPCA, Siobhan was very keen for us to get a Staffie, knowing and fully understanding the plight of the breed. So after 2 months in the Harmsworth, Dodger came to live with us in East London! We very quickly saw how loving and friendly this little dog was, despite the poor start in life that he had experienced, and we fell in love with him immediately. What can Dodger Dog do to make a real difference, and help save even more Staffies? Having raised my 3 children and owning dogs and pets throughout both theirs and my own life, I am totally committed to teaching children values and core behaviours from the very beginning. Pets can teach children about so many different things: life, death, personal responsibility, love, kindness, respect, duty of care, and so much more. These lessons learnt from a young age, will not only ensure that our children grow up to be responsible dog owners, but will also help them to become loving and responsible parents of the future. So as you can see, Dodger Dog is not only about saving Staffies, he stands for much more! His series of books covers many other equally important subjects, such as adoption, disability, respect for the environment, and many more valuable lessons. Through the Dodger Dog series of books I want this little dog, who so easily could have had a very different story, to leave a real legacy; embracing love and kindness and promoting fantastic values and behaviours to his readers, books that deliver messages that parents can instill in and enjoy with their children. 25% of all profits from Dodger’s books and Merchandise goes to various Dog charities, both in the UK and across the world.